"both a first class mystery and a cultural experience." 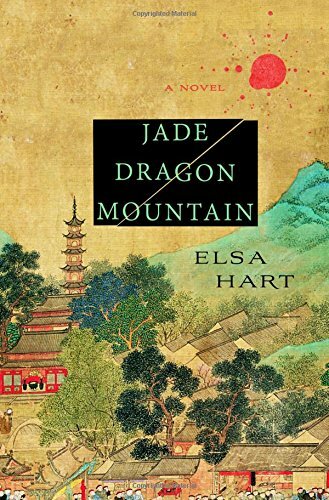 A delightful historical mystery that blends court intrigue and Chinese culture against the background of 1708 China, Jade Dragon Mountain by Elsa Hart is a stunning debut novel for fans of Robert Van Gulik’s Judge Dee mysteries. Considered by the rest of China to be an uncivilized province, populated “by peasants barely aware of Qing rule,” it is not an auspicious place, and it is one Li Du would avoid if he could. But he cannot; he must “register my presence upon arrival in a new prefecture.” The magistrate is Tulishen, Li Du’s cousin, who is not at all pleased to see him, but both understand the ritual that is required, Li Du most of all. “He understood the humiliation of his position, the required deference, and above all, the imperative that he not cause trouble, scandal, or any embarrassment whatsoever to the local officials.” All Li Du wants is for Tulishen to sign his papers so he can be on his way again. He wants no part of the gigantic festival that Tulishen is organizing. Most of all, he has no desire to be in Dayan when the Emperor arrives to demonstrate his divinity by commanding an eclipse. “The Emperor of China had the power, according to ancient tradition, to predict astronomical phenomena.” The intellectuals of China, such as Tulishen and Li Du, know that the Emperor depends upon Jesuit astronomers to provide a yearly calendar that predict such events as an eclipse. The rest of Chinese society remains in ignorance of this fact, or at least know better than to acknowledge it. One such Jesuit astronomer who arrives in Dayan to witness the phenomenon is Brother Pieter, “an old man as bleached as a dead tree on the plains” in the words of Tulishen. A second Jesuit is Brother Martin Walpole, a botanist who is confined to his room at a local inn suffering from nausea. Tulishen orders Li Du to stay in Dayan for a few days to serve as an interpreter for the Jesuits and Sir Nicholas Gray, an ambassador from the East India Company which wants to open trade with China. He brings fabulous gifts to the Emperor, including a device called a tellurion, a model of the heavens that moves by clockwork. Brother Pieter is fascinated by it. Lady Chen, honored consort to Tulishen in the absence of his wives left behind in Bijing, escorts Li Du to a guest room at the magistrate’s mansion. A regal, beautiful woman, Lady Chen lacks the lineage necessary to become a wife to Tulishen, but here in Dayan, “she had power.” She is not a woman to cross. Another member of household who has power of a different sort is Jia Huan, secretary to Tulishen and a man who “had the clean, unremarkable presence of a young scholar.” Although Jia Huan has only held his position for a month, Tulishen depends on him for his tact and efficiency. Another household member, one who is of little importance to Tulishen, is Mu Gao, who cares for the magistrate’s library. “He is barely literate, but his family used to be powerful in this province. That is the only reason he has a place here” Tulishen tells Li Du. Li Du, however, notices that certain things are not as they should be. A teacup is missing, and when he finds poison mixed with tea leaves in a leather purse made by Khampa and Tibetan merchants. When informed, Tulishen decides that the Khampa merchants with whom Brother Pieter traveled to Dayan must have poisoned the old Jesuit. When Li Du discovers that just such as purse was stolen in the city, he tells the Magistrate that someone in the mansion must be guilty of murder. “Whatever is necessary” may mean death for Li Du unless he can determine who among the household prisoned the old Jesuit. Jade Dragon Mountain is both a first class mystery and a cultural experience. Hopefully Ms. Hart is planning a sequel; Li Du and Hamza are characters too good to be discarded after only a single book.